A 172-page book of verse and prose poetry, The Book of Nods is divided into four sections: "The Book of Nods," "New York City Variations," "California Variations," and "Poems 1973-1985." "Nods" refer to Carroll's drug-induced states and the poems which result from them. 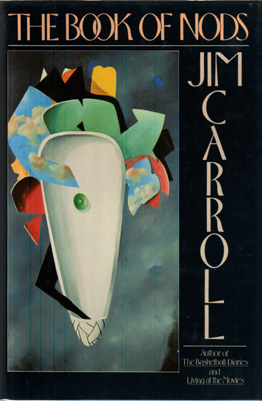 In the other three sections, the book's back cover notes, "Carroll grapples with his familiar themes--love, survival, obsession, good and evil, the city as landscape, paradise and prison--in language of special beauty and imagery of often religious intensity." The Book of Nods is out of print, but most of it is reprinted in Fear of Dreaming. It was published in hardcover as well as paperback editions. Additionally, the prose poems are published in the British 1987 Faber & Faber edition with The Basketball Diaries.